This project implements a network connected water level sensor, measuring the level in the sump pit of my house. 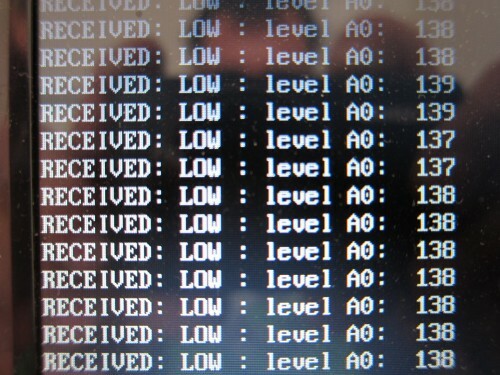 It’s connected to the home network and reports the water level by broadcasting UDP packets so that any computer can receive it and take action, such as sending out an alert or storing statistics. Before we go any further, let me just point out that the pressure sensor, MPX2010DP, used in this project exists in another version, MPX5010DP, that has an output voltage interval much better suited for this project. If only I had checked that I wouldn’t have needed to build any circuits or use any extra components at all. The pressure sensor MPX2010DP measures the pressure difference between two inputs, from 0 to 10 kPa and outputs between 0 and 25 mV on it’s two output pins. (The MPX5010DP gives you between 0 and 4.7 V output, ideal for direct connection to the analog inputs on Arduino.) This means that we can use it to reliably measure the water level in a tank or pit, without being troubled by changes in air pressure The only thing we need to do is connect input 1 to a hose leading to the bottom of the pit and leave input 2 hanging in the air. The MPX2010DP operates anywhere between 0 and 16 V and draws less than 10 mA, which means we can run it directly off the 5 V pin on the Arduino. 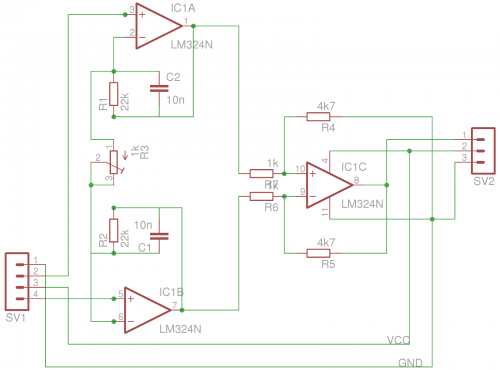 (MPX5010DP operates between 4.7 V and 5.25 V with about the same current draw, so in that case it’s even more ideal) It’s also possible to run the amplifier circuit from the Arduino, if you decide to go down that road. All this also means that you can run a long cable (I used shielded 4-wire telephone cable, but any 3-wire cable should be fine) from your Arduino to your sump pit or water tank. The amplifier circuit takes the input from the pressure sensor and amplifies the 25 mV maximum output to something more useful, like 5 V. Initially I used the circuit from Practical Arduino, and it worked fine when supplied with 12 V. When powering it with only 5 V it wouldn’t give me enough gain, so I had to rework the resistor values. I also scrapped the fourth amplifier as it didn’t really do anything for me. 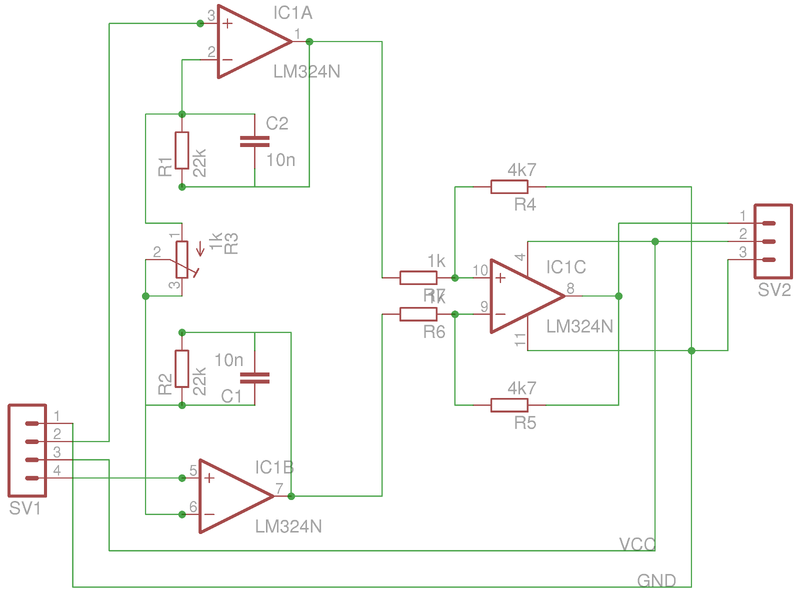 In the end what I had was an instrumentation amplifier. There is one trim potentiometer. It can be used to adjust the amplification, i.e. the sensitivity of the sensor, so that you get a good high reading for when the water level is high, and a good resolution in between. 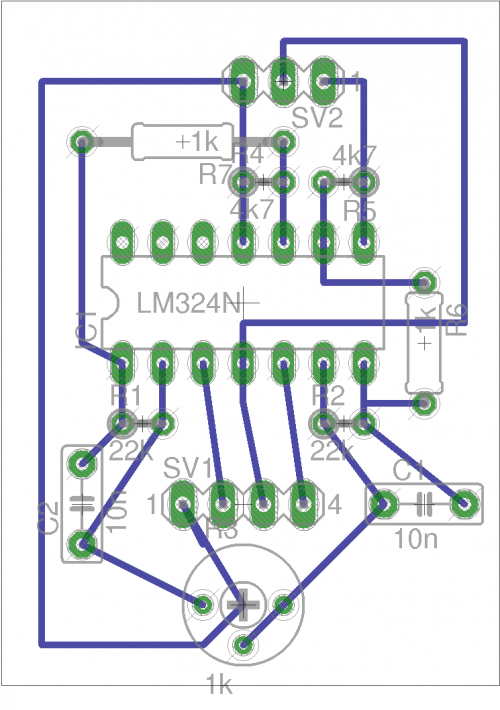 The PCB layout for the amplifier circuit. The lines and pads are a bit on the small side for manual drilling and soldering, but it's worked out well. For the second sensor – I have two sump pits – I created a PCB. It’s the first PCB ever that I designed myself and the second ever that I made myself, so it’s not exactly perfect. Most notably I didn’t change the size of anything on the board so all lines and connectors are very small, making it a pain to drill and solder. The program for the Arduino is pretty simple. I read the value from the analog input A0 and send it out as a broadcast UDP message. This allows me to receive the results on any computer in the house and do whatever I like with the results. So far I’m just monitoring the values. Of course I couldn’t leave it at that. For one thing, I need a way to calibrate the system and I don’t feel like modifying and uploading a new sketch for that, so I decided to create a serial port command line interface, allowing me to modify and read the trigger levels. I also made sure that the values are stored to the EEPROM and read back from there whenever the program starts, so that I won’t have to redo it whenever I need to reset the Arduino. Simple Java UDP Server displaying the output from the Arduino. If you keep it running it will remember the highest and lowest levels recorded. 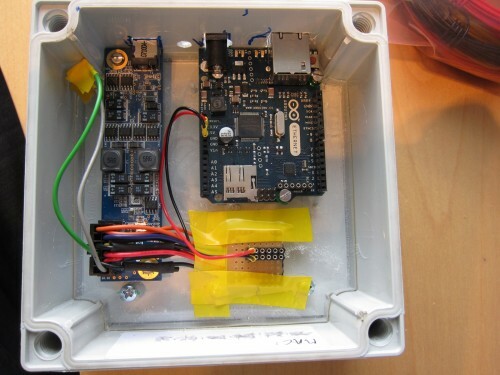 I used small and really cheap, although water resistant electrical connection boxes for the sensor and the electronics that live in the sump pit. For the Arduino I got a slightly smaller box to hold it and the power supply. I opted for one with a transparent lid so that I can see the electronics. I also got a case with some extra height to leave room for future shield extensions. 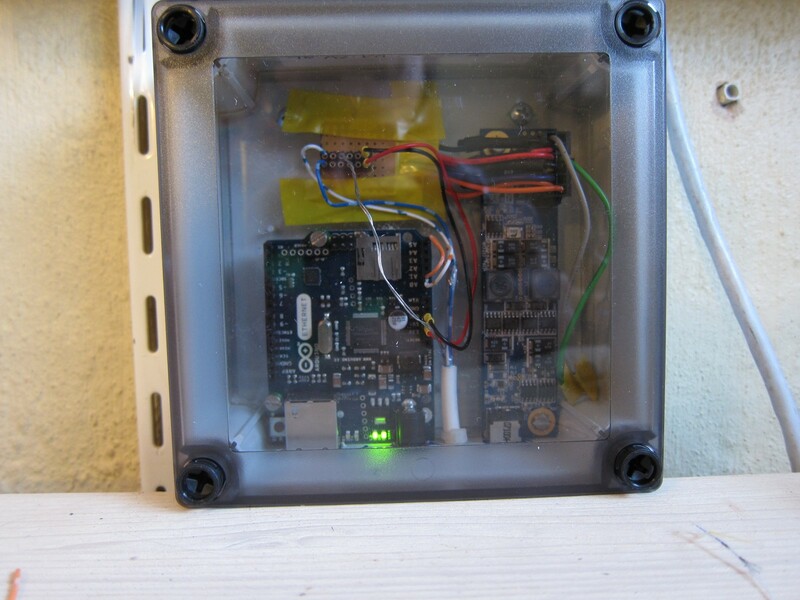 Arduino Ethernet and Pico-PSU mounted side by side on a plexi glass shield, fastened in the connection box. The first thing is to get yet another level sensor, for the second sump pit, wired up and to extend the sketch for that. 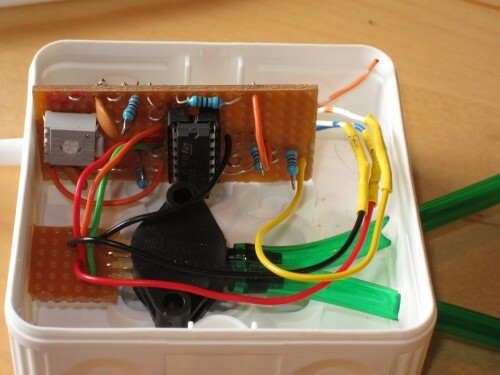 Then there are all kinds of ideas for further sensors, maybe checking the temperature in and outside of the house and why not monitor the fridge and freezer? I’m also thinking of connecting it to a mobile phone and enable the system to send me a text message whenever something unusual happens, such as the water rising above a specified level. For now, however, I’ll be quite happy to get both sensors installed and calibrated and have my web server presenting the results. That should just be a few weeks off. I may very well have missed something here. If you have any questions, please leave a comment and I’ll answer as soon as possible.